Congratulations to the 2015 Bob Stump Award recipient Becky Sundstrom! Becky Sundstrom was selected to receive the 2015 Bob Stump Memorial Award for her hard work and energy as a PCBA volunteer. As PCBA’s webmaster, Becky donated countless hours to building the new PCBA website into one of the premier bee club websites in the State. She created PCBA’s new Volunteer Signup Sheets website system, making it easier for the club to coordinate volunteers. 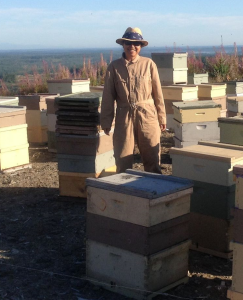 She received 100% on the WSBA Apprentice Beekeeping Certification exam, is a Journeyman Beekeeper candidate, and is a mentor to beginning beekeepers. Fluent in Mandarin Chinese, she is currently writing on Beekeeping in China for her Master Beekeeper thesis. Becky participated in many volunteer activities this year, including the Spring Fair and WA State Fair Bee Booths, helped coordinate the Bee Festival at Proctor Farmers’ Market and Sue Cobey Queen Rearing Workshop, and participated in Honeybee Awareness Legislative Day in Olympia. As a Swarm Team member, she helped save and re-home fours swarms of honeybees from Pierce County neighborhoods. As an educator with a passion for gardening and writing, Becky contributed several ‘In The Bee Garden’ articles to our Cappings Newsletter. Becky would like to thank Michael De’Angelo for his work on the website’s PayPal system and WordPress expertise, Jeff Jones for his bee knowledge, and all of the many PCBA members that donated content for the website. The Bob Stump Memorial Award is in honor of Bob’s commitment and love of beekeeping. He was dedicated to promoting the gentle art and science of beekeeping in the community. Bob was an exceptional leader and educator, sharing his enthusiasm and knowledge as a speaker, mentor and teacher. The Bob Stump Memorial Award is an honor bestowed upon an individual for outstanding contributions to apiculture. Nominees will be selected by the PCBA Board of Directors. One of these nominees will be voted in by the general membership at the PCBA general meeting in February of each year. The recipient must be a member in good standing of the Pierce County Beekeepers Association (PCBA). The actions of the recipient should be (but not limited to) complimentary to the art, science and husbandry of apiculture. The recipient need not be an active Washington State Beekeepers Association member. Previous recipients of this award are not eligible for future Bob Stump awards. The recipients names, past and present, will be on permanent display at the PCBA general meeting hall. 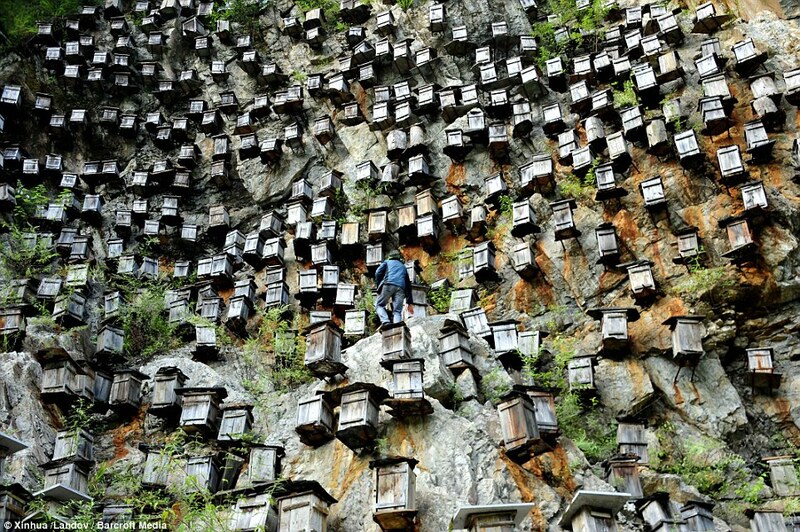 Bob was a Master Beekeeper. He was elected president of the Washington State Beekeepers Association in 1999 and served in that capacity through 2003. He also served as treasurer of the Master Beekeeper’s Committee for several years. His work and dedication in supporting WSU and Dr. Sheppard in their efforts has created a great partnership for all of us to follow. He was voted the 1996 WSBA Beekeeper of the Year. Beginning in 1987, the Washington State Beekeepers Association wanted to recognize the importance of Washington State beekeepers who make a significant impact on the industry. Each year local associations are asked to submit a candidate of their choice to receive the WSBA Beekeeper of the Year Award, to be voted on by the WSBA Executive Board prior to the annual meeting. Criteria: Which beekeeper has done the most to promote and demonstrate good beekeeping, improve the public image of the industry and/or show how this member has volunteered for civic and other projects. Bob Stump lived in Gig Harbor, WA. He passed away March 31, 2005. Members of his family include his wife, Tillie, and his six sons, two daughters and three stepchildren: son Robert, daughter Pat Hubbard (Don), son Bill (Mary Anne), daughter Betty Logan (Bob), son David (Chris), son Tom (Jeri), son Kevin (Heather), son Greg, and Tillie’s two daughters, Lucinda and Norma Jean, and son Ronald. Congratulations to the 2014 Bob Stump Award recipient Suwannee Robbins! Suwannee Robbins was selected to receive the PCBA Bob Stump Memorial Award for her continued work and energy to provide bees, supplies, education, information, and resources to new and experienced beekeepers. Suwannee is married to Harvard Robbins, a PCBA member with perhaps more years keeping bees than anyone else in Pierce County.